Are you tired of playing the same blues guitar riffs over and over? To play creative blues guitar, you must learn how to ‘create’ killer blues guitar riffs from scratch, instead of spending tons of hours online trying to find ‘tab’ of existing blues licks/riffs. Great blues guitarists are able to play ‘from the soul’ because they know how to easily create their own blues guitar riffs whenever they need to. Give me just a few minutes and I’ll show you how to quickly and easily use blues guitar double stops to turn any lick into a totally INTENSE blues guitar riff. 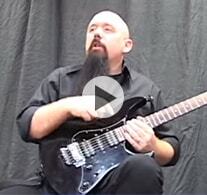 Get INSTANT FREE access to this blues guitar licks video. Simply enter your name and email, then click the "Show Me The Video" button to enter. All of your information is always kept 100% private and confidential.